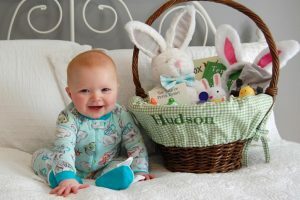 Hudson’s Easter Basket…and a Giveaway! 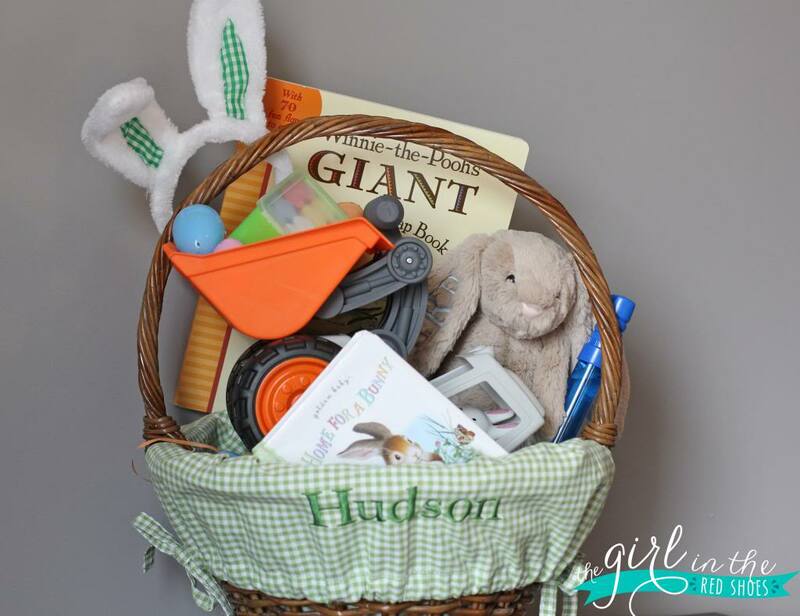 I’m SO excited for Hudson’s Easter basket this year! I can’t wait to see the look on his face when he finds all of these goodies. This year the Easter bunny is giving Hudson a Winnie the Pooh GIANT flap book, bunny ears, sidewalk chalk, a front loader truck (because what little boy Easter basket would be complete without a truck?) Home for a Bunny book, bubbles, and a stuffed bunny of course! I always LOVED stuffed animals when I was little and so far Hudson seems to love them too. 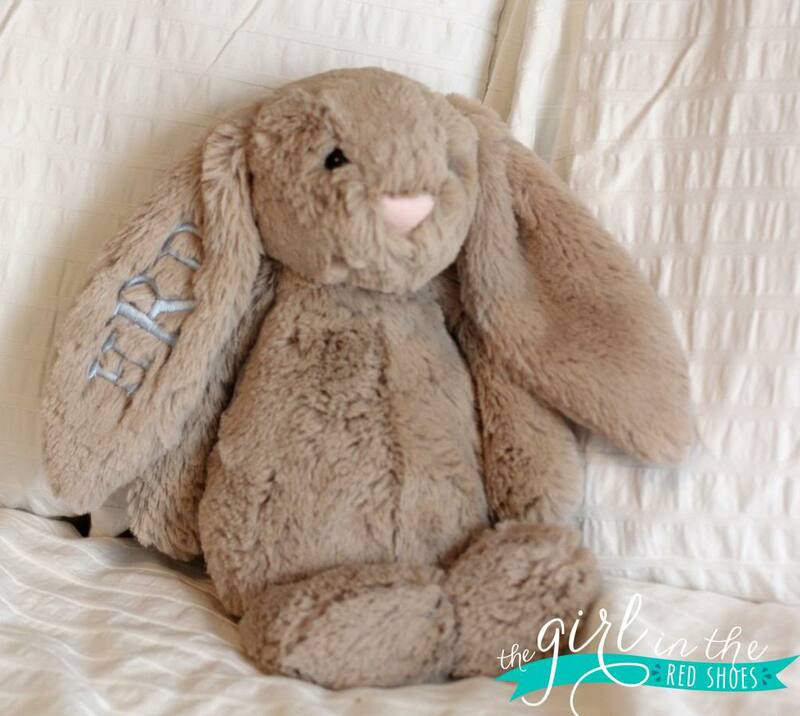 He is going to flip out over this adorable monogrammed bunny from Peek-A-Who! I love it so much. Want to know something else I love so much??? This photo from last year…. Oh my word. The cuteness. I just can’t take it. This year my friend Emily from Dear Owen has created the cutest and most thoughtful Blessing Basket! 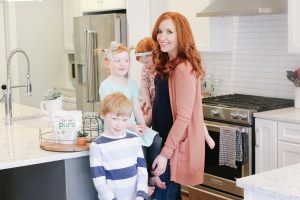 I love the idea of blessing others at Easter with these adorable baskets….read on for details on how Emily made her basket and a chance to win a printable bundle AND Target gift card so that you can make your own Blessing Basket! This year to celebrate Easter, I wanted to do something special for a few friends to let them know how much we appreciate them. After seeing the idea of a blessing basket on (in)courage. I knew this would be a perfect opportunity to spread a little Easter JOY. After a quick trip to Target and Staples our Blessing Basket was all set. All we had to do now was deliver them! We filled the basket with treats for mama and mini. A candle, cute napkins and straws from the “Oh Joy” line at Target, and festive toys for the little one. The basket (also from Target) was perfect for holding all the goods. 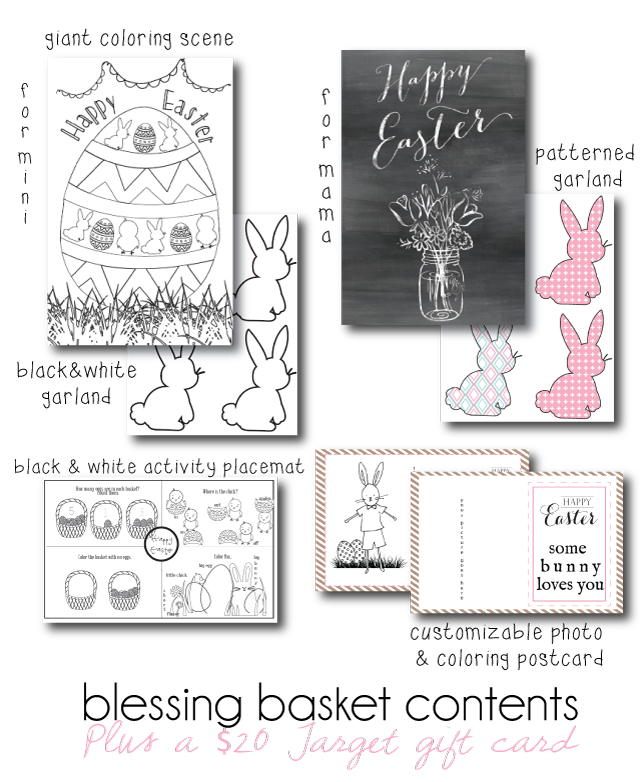 We also included all the items from our Printable Easter Bundle to the basket. Which I hope, made our friends feel extra special! After we dropped the basket off on the front porch Owen and I got to hiding our Easter eggs. We decided to put a spin on the traditional “You’ve Been Egged” game and hide Easter Eggs in the yard for our friend. We helped them get started with their Easter Story by making one of the eggs a Resurrection Egg. You can read more about this here. 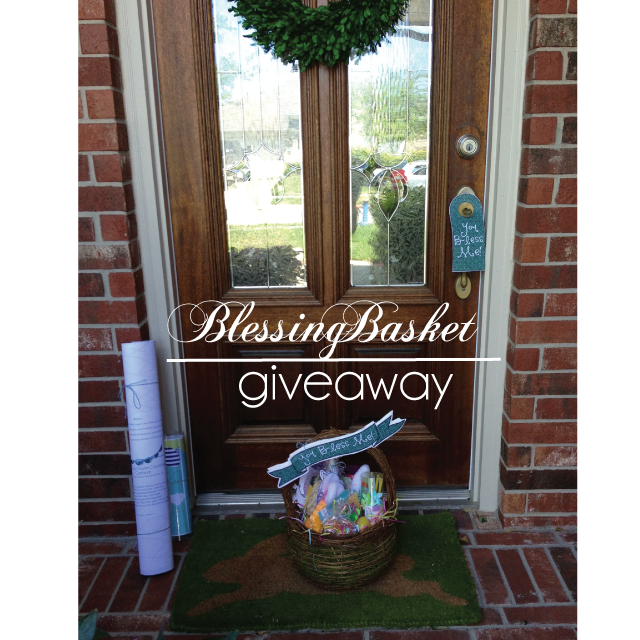 Today, I wanted to give all of you, Julie’s sweet readers, a chance to win your own Blessing Basket goodies!!! And just in case you want to start your basket now, visit Dear Owen to download your free door hanger and banner printables, perfect for making your basket extra special. Enter below to win a $20 Target gift card and a Printable Easter Bundle! I love the chalkboard Happy Easter printout! 🙂 So cute!! I like the patterned garland! Love Love Love it all.. so cute!! I like the chalboard happy easter sign. Very cute, the chalkboard sign is adorable! The patterned garland is precious! I love Hudson's Easter basket! My son is getting a bunny from Peek-a-Who too! 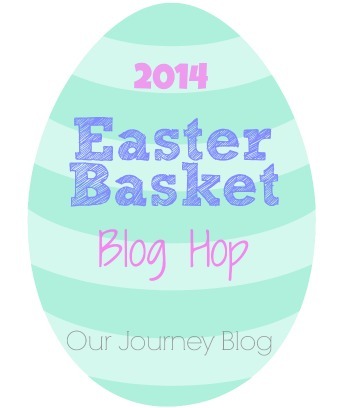 I also love the cute giveaway, the basket printable banner is adorable! I love the chalkboard Easter print! I love the patterned garland! Love his basket! I slacked on getting baskets ordered this year so Avery is stuff with a pail from Target =-). Love Emily's blessing basket as well. She's so thoughtful! 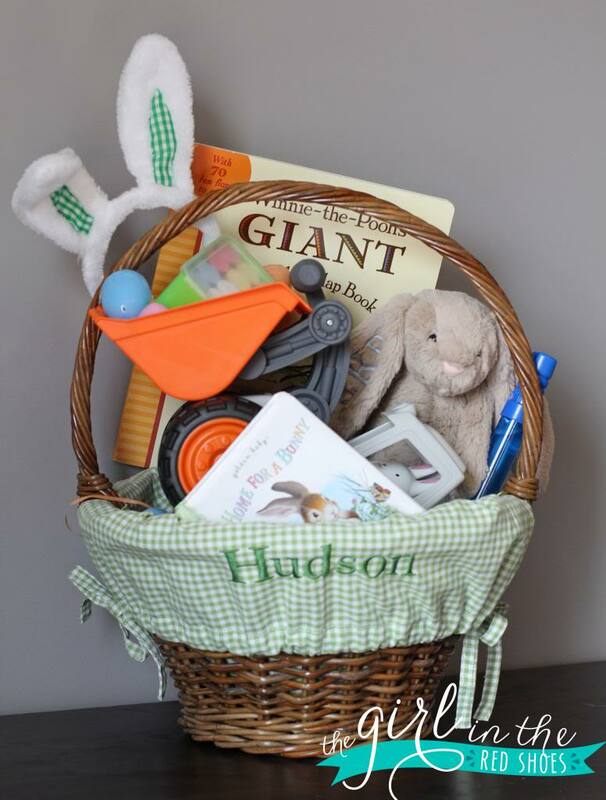 Hudson will LOVE his basket! I can't wait for lex to get hers either (a certain uncicorn will be making an appearance). And emily is seriously the sweetest and most thoughtful! Those blessing baskets are the sweetest surprise ever! I love the chalkboard sign… the garland is pretty stinkin' cute, too! Love the patterned garland! Such a cute gift basket idea! How cute is that chalkboard sign?! And I just want to give the bunny a big squeeze!! This is tough! I love all of it, but especially the garland and activity mat! the chalkboard sign is so cute! I love the blank and white garland! Adorable! I love the idea of a blessing basket! 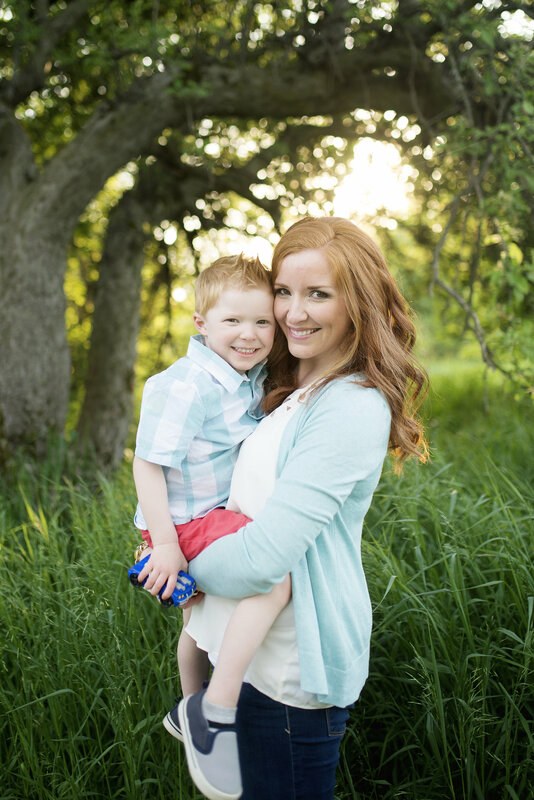 That picture of Hudson from last year is too cute for words – love his smile! I really like all the items Emily has, but my favorite is the chalkboard printable! Love the patterned garland! So cute! Everything is just adorable!! Love it all!! I love the chalkboard print! I love the chalk board paint. What a great idea to give a sweet gift to a friend! I love this!! Emily is too cute…the postcard is my favorite!!! I love the chalkboard sign!! So cute! Absolutely adore the chalkboard print! What a great idea! I may need to go make one of these for my favorite kids and surprise them this week! I know that they would love it. My daughter would LOVE the flap Pooh book. It's two of her favorite things! The chalkboard printout is too cute. Love how the basket came together! That front end loader is adorable. Now I have the Front End Loader Truck Tunes song stuck in my head! I love the printable garland! super cute! I adore the chalkboard sign! Great idea! I love the postcard for kids to color. I love the chalkboard happy Easter print! I like the customizable coloring postcard! such a cute idea! I adore the colorin pages!! Yeah for a fun giveaway! Will you be linking up the basket tomorrow with us? The patterned garland is so fun! I love the I chalkboard printable! 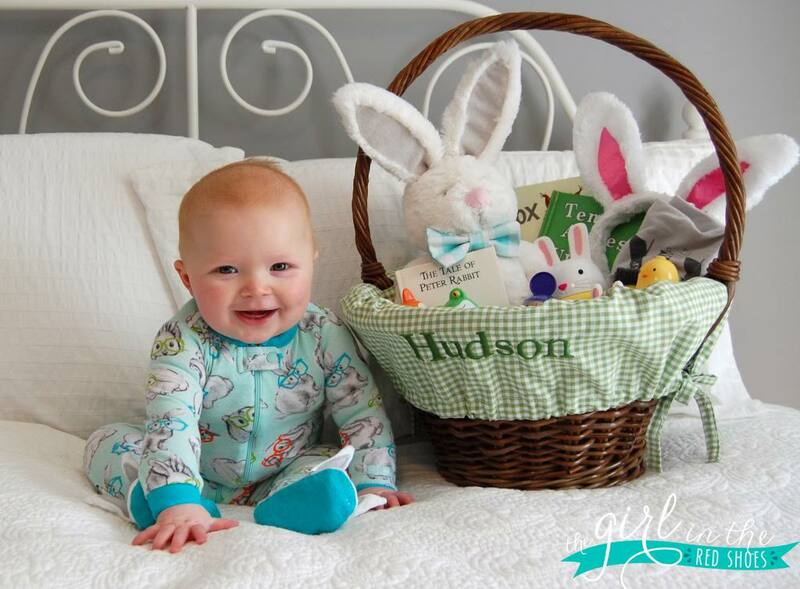 And oh my word, that picture from last year of Hudson is SO cute! The chalkboard printable is my favorite! And I absolutely love Hudson's monogrammed bunny! I love the chalkboard printable. 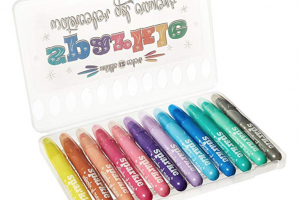 I love the chalkboard printable! So cute! I love the postcard. I know a couple grandparents that would be thrilled to get that. the chalkboard art print is gorgeous! Thank you! LOVE the black & white placemat! TOTALLY the chalkboard print. Super cute! 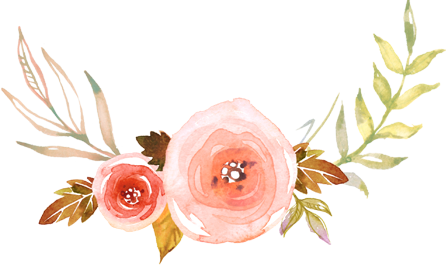 I love that patterned garland…I need a garland intervention these days! It just makes your home so happy and festive. Great basket! That bunny is the best! So sweet! I love the bunny and the dump truck! And that photo from last year is precious! Isn't is crazy the difference a year makes?! I love the printables, I'm always a sucker for free printables! Love that door knocker! Such a cute idea! I love the customizable photo postcard! The garland is so nice!! Great Easter basket! I'm sure your little one will just love it! My word – so much to say!!! First of all…. baby Hudson — oh my stars, how quickly they grow! I absolutely love his basket this year – job well done, friend! He's going to be so stinking excited! And lastly, is Emily not the kindest, sweetest, most genuine friend around? So blessed by her!! I seriously just about did a super ugly cry when I found all of those goodies on my front porch!!! 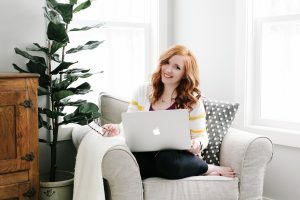 Love that you are hosting a fun giveaway — she is one talented girl! You are killing me with the throwback picture.